There are three versions of the Spine Races. The Spine Race itself follows the entire Pennine Way from Edale to Kirk Yetholm in Scotland. 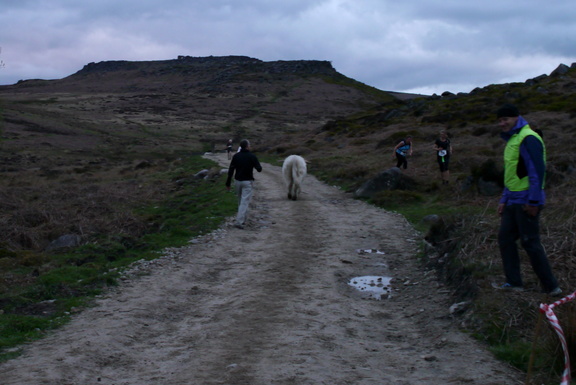 The shorter Spine Challenger starts at Edale but stops at Hardraw. The Spine Challenger MRT is the same as the Spine Challenger but is solely for active members of rescue teams. The races commence at different times which reduces crowding and checkpoints being inundated with runners. The Spine Challenger started at 8 am on Saturday 13 January 2018 with the Spine MRT Challenge starting half an hour later. With the first wave of runners out of the way the organisers could register and kit check the rest of the runners enabling the Spine Race to start at 8 am on Sunday 14 January 2018. The races have quite a reputation for being brutal due to the harsh winter conditions; the terrain and the darkness. Nevertheless they attract entrants from around the world such as New Zealand, USA, Japan, various European countries and many more. Of the 283 entrants across the three races 69 were from overseas. The weather and conditions started off very favourably on the Saturday. The ground was very dry and the anticipated bogs and deep water of Kinder Scout, Bleaklow and Black Hill seemed to have almost dried up making for a fast start. A mountain hare complete with white winter coat crossed my path shortly after Mill Hill which I took to be a good omen. A stiff breeze grew increasingly more intense and by Sunday evening gale force winds were forecast. By then the fastest Spine Challenger racers had already finished. On safety grounds the organisers enforced a route diversion to avoid the summit of Pen-y-ghent for later Spine Challenger and all Spine Race participants. The cut-off only applied after I tackled the original route and enjoyed the breezy conditions and sheet ice on the rocks in the pitch black of the second night. At Horton-in-Ribblesdale the cafe was open all night to cater for the runners. By the time I left fully refreshed and ready to go again their entire stock of pies had been consumed. Thereafter the winds continued unabated with horizontal sleet, snow and rain along the deeply rutted and waterlogged Cam Road. Passing Gayle and Hawes the heavy precipitation had caused the rivers to be in full spate which was a spectacular site to behold. Just before the finish at Hardraw the river had burst its banks and the road and bridge were underwater with no alternative route to the finish. However, it was possible to wade through and reach the finish even wetter than before. For the Spine Race the fun continued for about another 160 miles as the weather worsened. Snow storms closed roads and at one point the Spine Race was paused with competitors being held at checkpoints until conditions eased off. Towards the end it was necessary to wade through not just mud and bogs but also waist deep snow in parts. On the last day the weather eased off enabling those just beating the cut-offs to finish successfully. With the tough terrain and vicious weather conditions these races require more survival skills than running ability. Of the five runners most expected to win only one finished with the other four pulling out for various reasons. As the race continued the temperatures dropped and the winds increased. Rain, snow and sleet battered the participants and the effects of wind-chill only exacerbating matters. By the Tuesday high winds and blizzards were hampering runners while the country was grid-locked in places with roads closed and severe weather warnings were in force. The next day those runners who had brought snow shoes were able to cope with the deep snow-drifts while others floundered around in waist deep snow. Further snow and more high winds were forecast to continue. Due to blizzards and high winds the race was temporarily halted on Wednesday evening with runners being held back at checkpoints for conditions to improve. This gave them scope to rest and recuperate before being allowed to continue again at 6 am on the Thursday. That evening Pavel Paloncy was the first to finish. This was his third win and fifth completion of the Spine Race. Three previous winners failed to complete the course this year. Early on Friday evening Carol Morgan finished amidst a snow storm to secure her second victory in the Spine Race. A few hours later Gregory Crowley arrived at the finish for his fourth successful completion of the Spine Race and each of those finishes have been top ten places. On the Saturday the weather eased off enabling the final runners to finish with glorious views of The Cheviots covered in snow or in the dark as the case may be. Overall there were 53 finishers and some only a few hours inside the cut-off. Fewer than half the starters managed to finish. The women's race was won by former England International fellrunner Emma Hopkinson who knocked over 40 minutes off the previous record. Second and third ladies were both Dark Peak Fell Runners.